Feynman’s analysis of a maser – microwave amplification, by stimulated emission of radiation – combines an awful lot of stuff. Resonance, electromagnetic field theory, and quantum mechanics: it’s all there! Therefore, it’s complicated and, hence, actually very tempting to just skip it when going through his third volume of Lectures. But let’s not do that. What I want to do in this post is not repeat his analysis, but reflect on it and, perhaps, offer some guidance as to how to interpret some of the math. Don’t shy away now. It’s not so difficult. Try to understand. The nitrogen atom (N) in the ammonia molecule (NH3) can tunnel through the plane of the three hydrogen (H) atoms, so it can be ‘up’ or ‘down’. This ‘up’ or ‘down’ state has nothing to do with the classical or quantum-mechanical notion of spin, which is related to the magnetic moment. Nothing, i.e. nada, niente, rien, nichts! Indeed, it’s much simpler than that. 🙂 The nitrogen atom could be either beneath or, else, above the plane of the hydrogens, as shown above, with ‘beneath’ and ‘above’ being defined in regard to the molecule’s direction of rotation around its axis of symmetry. That’s all. That’s why we prefer simple numbers to denote those two states, instead of the confusing ‘up’ or ‘down’, or ‘↑’ or ‘↓’ symbols. We’ll just call the two states state ‘1’ and state ‘2’ respectively. Having said that (i.e. having said that you shouldn’t think of spin, which is related to the angular momentum of some (net) electric charge), the NH3 molecule does have some electric dipole moment, which is denoted by μ in the illustration and which, depending on the state of the molecule (i.e. the nitrogen atom being above or beneath the plane of the hydrogens), changes the total energy of the molecule by an amount that is equal to +με or −με, with ε some external electric field, as illustrated by the ε arrow on the left-hand side of the diagram. [You may think of that arrow as an electric field vector.] This electric field may vary in time and/or in space, but we’ll not worry about that now. In fact, we should first analyze what happens in the absence of an external field, which is what we’ll do now. The NH3 molecule will spontaneously transition from an ‘up’ to a ‘down’ state, or from ‘1’ to ‘2’—and vice versa, of course! This spontaneous transition is also modeled as an uncertainty in its energy. Indeed, we say that, even in the absence of an external electric field, there will be two energy levels, rather than one only: E0 + A and E0 − A. The graph below shows how these probabilities evolve over time. Note that, because of the square, the period of cos2[(A/ħ)·t] and sin2[(A/ħ)·t] is equal to π, instead of the usual 2π. The interpretation of this is easy enough: if our molecule can be in two states only, and it starts off in one, then the probability that it will remain in that state will gradually decline, while the probability that it flips into the other state will gradually increase. As Feynman puts it: the first state ‘dumps’ probability into the second state as time goes by, and vice versa, so the probability sloshes back and forth between the two states. The graph above measures time in units of ħ/A but, frankly, the ‘natural’ unit of time would usually be the period, which you can easily calculate as (A/ħ)·T = π ⇔ T = π·ħ/A. In any case, you can go from one unit to another by dividing or multiplying by π. Of course, the period is the reciprocal of the frequency and so we can calculate the molecular transition frequency f0 as f0 = A/[π·ħ] = 2A/h. [Remember: h = 2π·ħ, so A/[π·ħ] = 2A/h]. Of course, by now we’re used to using angular frequencies, and so we’d rather write: ω0 = 2π·f0 = f0 = 2π·A/[π·ħ] = 2A/ħ. And because it’s always good to have some idea of the actual numbers – as we’re supposed to model something real, after all – I’ll give them to you straight away. The separation between the two energy levels E0 + A and E0 − A has been measured as being equal to 2A = hf0 ≈ 10−4 eV, more or less. 🙂 That’s tiny. To avoid having to convert this to joule, i.e. the SI unit for energy, we can calculate the corresponding frequency using h expressed in eV·s, rather than in J·s. We get: f0 = 2A/h = (1×10−4 eV)/(4×10−15 eV·s) = 25 GHz. Now, we’ve rounded the numbers here: the exact frequency is 23.79 GHz, which corresponds to microwave radiation with a wavelength of λ = c/f0 = 1.26 cm. How does one measure that? It’s simple: ammonia absorbs light of this frequency. The frequency is also referred to as a resonance frequency, as light of this frequency, i.e. microwave radiation, will also induce transitions from one state to another. In fact, that’s what the stimulated emission of radiation principle is all about. But we’re getting ahead of ourselves here. It’s time to look at what happens if we do apply some external electric field, which is what we’ll do now. Don’t rack your brain over how you get that square root thing. You get it when applying the general solution of a pair of Hamiltonian equations to this particular case. For full details on how to get this general solution, I’ll refer you to Feynman. Of course, we’re talking base states here, which do not always have a physical meaning. However, in this case, they do: a jet of ammonia gas will split in an inhomogeneous electric field, and it will split according to these two states, just like a beam of particles with different spin in a Stern-Gerlach apparatus. 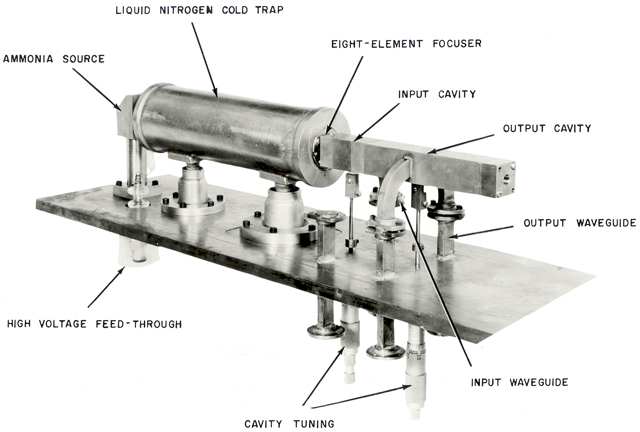 A Stern-Gerlach apparatus splits particle beams because of an inhomogeneous magnetic field, however. So here we’re talking an electric field. The bottom line is that our ammonia jet will split into two separate beams: all molecules in state I will be deflected toward the region of lower ε2, and all molecules in state II will be deflected toward the region of larger ε2. [We talk about ε2 rather than ε because of the ∇ε2 gradient in that force formula. However, you could, of course, simplify and write ∇ε2 as ∇ε2 = 2ε∇ε.] So, to make a long story short, we should now understand the left-hand side of the schematic maser diagram below. It’s easy to understand that the ammonia molecules that go into the maser cavity are polarized. But so here we are talking induced transitions. As you can see, the frequency and, hence, the period, depend on the strength, or magnitude, of the electric field, i.e. the ε0 constant in the ε = 2ε0cos(ω·t) expression. The natural unit for measuring time would be the period once again, which we can easily calculate as (με0/ħ)·T = π ⇔ T = π·ħ/με0. However, Feynman adds an 1/2 factor so as to ensure it’s the time that corresponds to the time a molecule needs to go through the cavity. Well… That’s what he says, at least. I’ll show he’s actually wrong, but the idea is OK.
First have a look at the diagram of our maser once again. You can see that all molecules come in in state I, but are supposed to leave in state II. Now, Feynman says that’s because the cavity is just long enough so as to more or less ensure that all ammonia molecules switch from state I to state II. Hmm… Let’s have a close look at that. What the functions and the graph are telling us is that, at the point t = 1 (with t being measured in those π·ħ/2με0 units), the probability of being in state I has all been ‘dumped’ into the probability of being in state II! So… Well… Our molecules had better be in that state then! 🙂 Of course, the idea is that, as they transition from state I to state II, they lose energy. To be precise, according to our expressions for EI and EII above, the difference between the energy levels that are associated with these two states is equal to 2A + μ2ε02/A. As Feynman notes, it is not so simple to explain how exactly the energy of the molecules is being fed into the oscillations of the cavity: it would require to also deal with the quantum mechanics of the field in the cavity, in addition to the quantum mechanics of our molecule. So we won’t get into that nitty-gritty—not here at least. So… Well… That’s it, really. Of course, you’ll wonder about the orders of magnitude, or minitude, involved. And… Well… That’s where this analysis is somewhat tricky. Let me first say something more about those resonant cavities because, while that’s quite straightforward, you may wonder if they could actually build something like that in the 1950s. 🙂 The condition is that the cavity length must be an integer multiple of the half-wavelength at resonance. We’ve talked about this before. [See, for example, my post on wave modes. More formally, the condition for resonance in a resonator is that the round trip distance, 2·d, is equal to an integral number of the wavelength λ, so we write: 2·d = N·λ, with N = 1, 2, 3, etc. Then, if the velocity of our wave is equal to c, then the resonant frequencies f will be equal to f = (N·c)/(2·d). […] Hmm… That doesn’t look good. Even when traveling at the speed of light – which our ammonia molecule surely doesn’t do! – it would only travel over a distance equal to (3×108 m/s)·(20×10−12 s) = 60×10−4 m = 0.6 cm = 6 mm. The speed of our ammonia molecule is likely to be only a fraction of the speed of light, so we’d have an extremely short cavity then. The time mentioned is also not in line with what Feynman mentions about the ammonia molecule being in the cavity for a ‘reasonable length of time, say for one millisecond.‘ One millisecond is also more in line with the actual dimensions of the cavity which, as you can see from the historical illustration below, is quite long indeed. However, that doesn’t tell us anything new. It just says that the transition period (T) is inversely proportional to the strength of the field (as measured by ε0). So a weak field will make for a longer transition period (T), with T → ∞ as ε0 → 0. So it all makes sense, but what do we do with this? The Tinduced/Tspontaneous = [με0/A]−1 is the most telling. It says that the Tinduced/Tspontaneous is inversely proportional to the με0/A ratio. For example, if the energy με0 is only one fifth of the energy A, then the time for the induced transition will be five times that of a spontaneous transition. To get something like a millisecond, however, we’d need the με0/A ratio to go down to like a billionth or something, which doesn’t make sense. So what’s the explanation? Is Feynman hiding something from us? He’s obviously aware of these periods because, when discussing the so-called three-state maser, he notes that “The | I 〉 state has a long lifetime, so its population can be increased.” But… Well… That’s just not relevant here. He just made a mistake: the length of the maser has nothing to do with it. The thing is: once the molecule transitions from state I to state II, then that’s basically the end of the story as far as the maser operation is concerned. By transitioning, it dumps that energy 2A + μ2ε02/A into the electric field, and that’s it. That’s energy that came from outside, because the ammonia molecules were selected so as to ensure they were in state I. So all the transitions afterwards don’t really matter: the ammonia molecules involved will absorb energy as they transition, and then give it back as they transition again, and so on and so on. But that’s no extra energy, i.e. no new or outside energy: it’s just energy going back and forth from the field to the molecules and vice versa. So, in a way, those PI and PII curves become irrelevant. Think of it: the energy that’s related to A and με0 is defined with respect to a certain orientation of the molecule as well as with respect to the direction of the electric field before it enters the apparatus, and the induced transition is to happen when the electric field inside of the cavity points south, as shown in the diagram. But then the transition happens, and that’s the end of the story, really. Our molecule is then in state II, and will oscillate between state II and I, and back again, and so on and so on, but it doesn’t mean anything anymore, as these flip-flops do not add any net energy to the system as a whole. So that’s the crux of the matter, really. Mind you: the energy coming out of the first masers was of the order of one microwatt, i.e. 10−6 joule per second. Not a lot, but it’s something, and so you need to explain it from an ‘energy conservation’ perspective: it’s energy that came in with the molecules as they entered the cavity. So… Well… That’s it. If there would be no electric field, i.e. if ε0 = 0, then PI = 1 and PII = 0. So, our ammonia molecules enter in state I and, more importantly, stay in state I forever, so there’s no chance whatsoever to transition to state II. Also note what I wrote above: Tinduced = h/(4με0), and, therefore, we find that T → ∞ as ε0 → 0. So… Well… That’s it. I know this is not the ‘standard textbook’ explanation of the maser—it surely isn’t Feynman’s! But… Well… Please do let me know what you think about it. What I write above, indicates the analysis is much more complicated than standard textbooks would want it to be. There’s one more point related to masers that I need to elaborate on, and that’s its use as an ‘atomic’ clock. So let me quickly do that now. In light of the amazing numbers involved – we talked GHz frequencies, and cycles expressed in picoseconds – we may wonder how it’s possible to ‘tune’ the frequency of the field to the ‘natural’ molecular transition frequency. It will be no surprise to hear that it’s actually not straightforward. It’s got to be right: if the frequency of the field, which we’ll denote by ω, is somewhat ‘off’ – significantly different from the molecular transition frequency ω0 – then the chance of transitioning from state I to state II shrinks significantly, and actually becomes zero for all practical purposes. That basically means that, if the frequency isn’t right, then the presence of the oscillating field doesn’t matter. In fact, the fact that the frequency has got to be right – with tolerances that, as we will see in a moment, are expressed in billionths – is why a maser can be used as an atomic clock. The graph below illustrates the principle. If ω = ω0, then the probability that a transition from state I to II will happen is one, so PI→II(ω)/PI→II(ω0) = 1. If it’s slightly off, though, then the ratio decreases quickly, which means that the PI→II probability goes rapidly down to zero. [There’s secondary and tertiary ‘bumps’ because of interference of amplitudes, but they’re insignificant.] As evidenced from the graph, the cut-off point is ω − ω0 = 2π/T, which we can re-write as 2π·f − 2π·f0 = 2π/T, which is equivalent to writing: (f − f0)/f0 = 1/(f0T). Now, we know that f0 = 23.79 GHz, but what’s T in this expression? Well… This time around it actually is the time that our ammonia molecules spend in the resonant cavity, from going in to going out, which Feynman says is of the order of a millisecond—so that’s much more reasonable that those 40 picoseconds we calculated. So 1/(f0T) = 1/[23.79×109·1×−3] ≈ 0.042×10−6 = 42×10−9 , i.e. 42 billionths indeed, which Feynman rounds to “five parts in 108“, i.e. five parts in a hundred million. In any case, a maser is not build to produce huge amounts of power. On the contrary, the state selector obviously consumes more power than comes out of the cavity, obviously, so it’s not some generator. Its main use nowadays is as a clock indeed, and so it’s that simple really: if there’s no output, then the ‘clock’ doesn’t work. So… Well… Not bad. 🙂 Of course, one needs another clock to check if one’s clock is still accurate, and so that’s what’s done internationally: national standards agencies in various countries maintain a network of atomic clocks which are intercompared and kept synchronized. So these clocks define a continuous and stable time scale, collectively, which is referred to as the International Atomic Time (TAI, from the French Temps Atomique International). Well… That’s it for today. I hope you enjoyed it. When I say the ammonia molecule just dumps that energy 2A + μ2ε02/A into the electric field, and that’s “the end of the story”, then I am simplifying, of course. The ammonia molecule still has two energy levels, separated by an energy difference of 2A and, obviously, it keeps its electric dipole moment and so that continues to play as we’ve got an electric field in the cavity. In fact, the ammonia molecule has a high polarizability coefficient, which means it’s highly sensitive to the electric field inside of the cavity. So, yes, the molecules will continue ‘dancing’ to be the beat of the field indeed, and absorbing and releasing energy, in accordance with that 2A and με0 factor, and so the probability curves do remain relevant—of course! However, we talked net energy going into the field, and so that’s where the ‘end of story’ story comes in. I hope I managed to make that clear.